In this fun interview with Professional Negotiator and Director of the American Negotiation Institute, Kwame Christian, we discuss the difference between negotiation and conflict. You’ll learn some straight forward easy to implement strategies to initiate those awkward conversations plus you’ll learn the 3 steps you must take to get what you want and maintain good relationships – hint – it’s always about the relationship. If you’re looking for some tips to influence people, you won’t want to miss this interview. 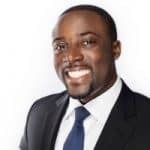 Kwame Christian is a business lawyer and the Director of the American Negotiation Institute. In this role he conducts live negotiation and conflict resolution training sessions for organizations. Kwame’s Tedx Talk, Finding Confidence in Conflict, was viewed over 24,000 times in less than 24 hours and was the most popular Tedx Talk on conflict of 2017. Kwame hosts the podcast Negotiate Anything, where he interviews successful professionals and shares powerful persuasion techniques. With over 200,000 downloads and listeners in 140 countries, it is the top-ranked negotiation and dispute-resolution podcast in the nation. Kwame is the proud husband of Dr. Whitney Christian and father of Kai Christian.